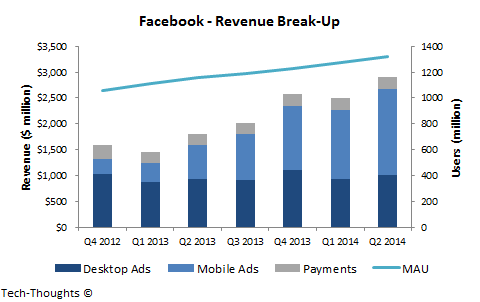 This quarter's results announcement from Facebook underscored a now familiar trend -- Mobile advertising revenues are skyrocketing while the desktop advertising and payments business remain in a holding pattern. Jan Dawson from Jackdaw Research has a terrific collection of charts that summarize Facebook's financial picture. However, I disagree with his position Facebook's app install ad business. 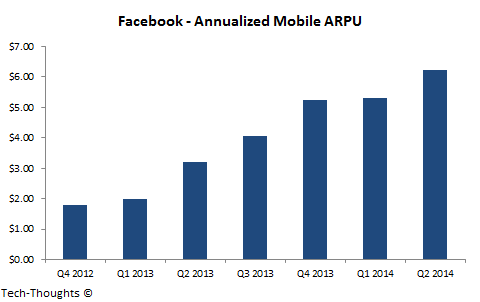 In the last six quarters, Facebook's annualized mobile ARPU has tripled from $2 to more than $6. This coincides with the launch of Facebook's app install ads. Based Facebook's metrics and my own estimates, app install ads generated roughly 21% of Facebook's mobile advertising revenue in Q3 2013. By now, it is clear that app install ads have been a key driver of Facebook's mobile fortunes. But has Facebook's focus on app install ads shifted attention away from their payments revenue stream? Not quite. That particular revenue stream was a result of in-game purchases from games on Facebook's web platform. As consumers shifted to mobile devices, payment processing shifted from Facebook to platform-specific appstores. In order to make up for lost revenue, Facebook began collecting app usage data from apps that had integrated the Facebook SDK (200,000 apps at last count). Facebook then used this data to create a targeted ad unit aimed at app developers. This also means that the impact of competition on Facebook's app install business is vastly overstated. Twitter does not have the required data to compete with Facebook's app install targeting. Facebook's only real competition is likely to be Google and possibly Yahoo (depending on the quality of Flurry's data). Another assertion I disagree with is that the app install ad business has limited potential. This hypothesis is based on the assumption that app install ad revenue is based on developer marketing budgets. These budgets are assumed to be a percentage of appstore revenues. I would be very supportive of this methodology if our goal was to estimate the potential of app install ads for game developers. Unfortunately, this analysis fails when we take into account apps that monetize off-store and apps that aren't meant to have a direct monetization model. For example, app categories like e-commerce (Amazon), transport (Uber), travel portals, etc. use app install ads to increase penetration, but their revenues are not routed through appstores. Companies like Walmart and Starbucks use their apps as customer engagement tools, but the apps themselves generate little to no revenue. Based on admittedly anecdotal evidence, these app categories are more frequent users of Facebook's app install ads. At the very least, they could make up a non-negligible portion of Facebook's app install ad revenue. As app usage increases, I expect this category of apps to become even more prominent. In effect, this means that every company with an app is a potential customer for app install ads. This does not necessarily mean that Facebook will dominate this market -- Google could take this market by storm for all we know. But it does mean that app install ads are likely to be a very lucrative market, especially for companies that have access to app usage data.